In this post we will be discussing about C# 7 Tuples using Visual Studio 2017 RC. 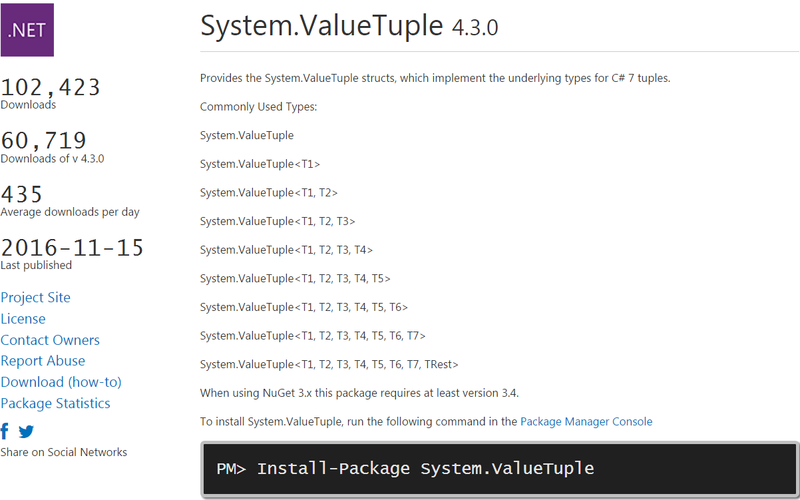 Microsoft has announced a lot of new useful features that make C# development a lot easier in C# 7, and one of the feature is Tuples. You will never have thought that knowing it could be so beneficial in developing applications in C#. In simple terms a tuple is a finite ordered list of elements. 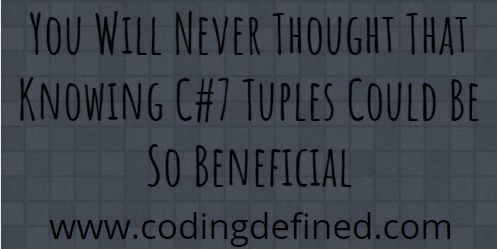 In C# 7 a new feature is introduced to improve the support of tuples. This is done to improve the performance and software design. It helps in improving the performance because you don't need to store a tuple as an instantiated class to use it in your code anymore thus it removes the memory overhead. You need to have latest update of Visual Studio 2015 or the Visual Studio 2017 RC to take advantage of the tuple value type. We will be using Visual Studio 2017. You also need to install ValueTuple NuGet Package to work with tuple value types in your project. In the above example we have given a name to each parameter passed, but even if you do not give name you can access it using values.item1, values.item2 etc. Visual Studio provides you with both the name values and the order values, thus even if you forget the name you can access it via the order just like the System.Tuple class. The best place to use tuples is when you are getting records or storing records from the database. This is usefuk because tuples can store a row no matter how many fields it has or the datatype each field possess. Other places to use tuples is to store them as global variables which can be used throughout your application thus you do not have to declare multiple constant values. The other places as shown above is to pass multiple values from a function. It can also help to remove hash table or dictionary which takes more memory.